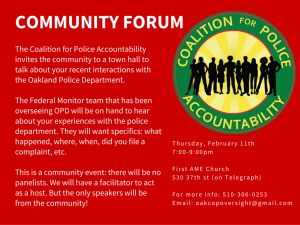 The Coalition for Police Accountability announced a community forum with the Federal monitor of the now 13 year old consent decree that was imposed after the Rider’s scandal. Testimony at this forum will provide more public awareness of the drive to establish a Police Commission with a charter amendment. This entry was posted on February 8, 2016 at 4:37 pm. You can follow any responses to this entry through the RSS 2.0 feed. Both comments and pings are currently closed.